This party is focused on a experience between human and nature. The Cosmic Moon will be in her most enlightened position, and we will have the opportunity to bath in the beauty of mother nature. 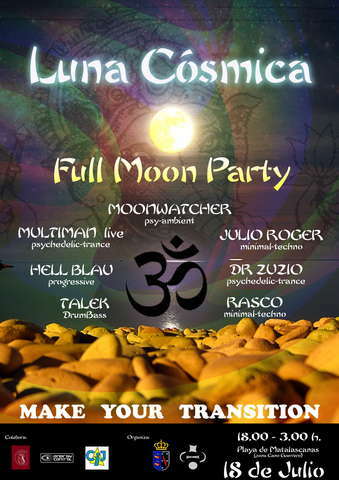 This gathering aims to get an altered state by all the natural elements, enjoying a beautifull sunset and the final process of the full moon. Then, the sand, water, moon, sky and colours will mix in tune with the music, which will be present all the time to guide us among different states of mind. Take all you need to spend the best sunset of the summer with us !!! .... before VuuV !!! Food & Drinks in "Ambos Mundos Bar", next to the party!! * Dont bring your pet to the beach, police can fine you! * No glass, No fire!